"Kid Amazo" - Part 5: "Twilight of the Gods"
Batman and Superman inform Kid Amazo that not only does he have the power of his father to replicate the powers of the Justice League but to replicate their personalities as well. Frank doesn't deal with this well and flies off. Flash reasserts his feeling that they should have destroyed Frank when they had the chance. Batman explains that Flash's idea may not be as easy as he thinks since Frank's abilities would allow him to exploit any emotional weakness they have. John Stewart suggests disbanding and taking Kid Amazo on separately but Wonder Woman points out that if they do that Ivo has effectively destroyed the Justice League. Batman agrees adding that they have to somehow be a better team than Kid Amazo is. Kid Amazo confronts Ivo and demands to know who his mother his. Reluctantly and after some intimidation Ivo agrees and calls out for the woman to come in since her son wants to see her. In walks Sara, who admits that she is indeed Frank's mother. Ivo reveals that Sara is his daughter and was placed with him to serve as a catalyst in case he started wavering in his hatred of the Justice League. Sara adds that they were willing to fake her death and blame the League if need be. Frank cannot believe what he is hearing. He insists that he loved Sara and the daughter of Ivo coldly tells him that he was programmed to. She leaves with Frank yelling after her that he knew she felt something for him. Retreating to his room Frank has one last conversation with the bust of Nietzsche as he shaves his head. "Nietzsche" begs Frank not to go after the Justice League but after a long rant about how the Justice League is the embodiment of slave morality that he will show them their Nietzschean ideals unfettered by that very same morality. Before he leaves Frank breaks the bust and tells his imaginary friend that it had been nice talking to him. Frank begins to destroy large sections of Berkley to draw the League out. Flash is the first to arrive but Frank quickly uses the speedster's own psychological weaknesses against him. Green Lantern comes in next allowing the Flash to leave the battlefield. After taking care of Wally Superman and J'onn fly off and find the broken and battered form of John Stewart lying in a pile of rubble. John tells them that they can no more defeat Frank than face down their own inner demons. Batman arrives with the unconscious form of Wonder Woman. Superman begins to ask what happened when Batman suddenly head butts the Man of Steel and reveals that he is wearing his Kryptonite ring. When Bruce Wayne stumbles up to the group it becomes clear that Frank has assumed Batman's uniform before Frank continues his savage attack. After Batman questions who Frank really is on the inside the League discusses the problems that they have with each other as a team. This causes Frank's ability to replicate their emotions to go into overdrive and it overloads his systems. Kid Amazo dies in a fiery explosion. At first the Flash is excited but the victory feels hollow as the League is forced to confront what they have been shown about themselves as a team. Story - 4: I'm giving this issue a four out of five because I feel that from beginning to end Peter Milligan stayed true to the themes he set out to explore. All of the characters kept a consistent voice and, more importantly I was entertained. Having said all of that, WHAT WAS UP WITH SARA TURNING OUT TO BE FRANK'S MOM? I mean whoa. Really. Whoa. Keanu Reeves watching Lawrence Fishburne jump from one rooftop to another whoa. I have to say, I did not see that one coming. So outside of being kind of weirded out about Frank dating his own mother (which did make sense in a strange sort of way) I thought that "Kid Amazo" wrapped up rather well. It was inevitable that the Justice League would have to have one, no holds barred battle with Frank and the revelation that Frank could replicate their personalities as well as their powers was an interesting twist to throw in. Again, it makes perfect sense given what had come before. Milligan's story was more psychological in nature so while there were brief bursts of action the bulk of the storytelling was dialogue driven. This was one of the aspects of the story that I liked the most, though. It's nice to have my fiction engage me on this level. My one real complaint came from the ending and this, like in so many other reviews I've done for this site, is purely personal in nature. Before INFINITE CRISIS we went through a period of the heroes in the DCU questioning themselves and doubting each other. Frankly I got sick of it real quick. I enjoyed some of the stories but after a while it really played itself out. So the fact that the end of this arc had the League looking at each other in distrust just brought back that feeling and nearly ruined the story for me. In the end I told myself that it was the story Milligan wanted to tell and looking at the story it was pretty much the way it should have ended. 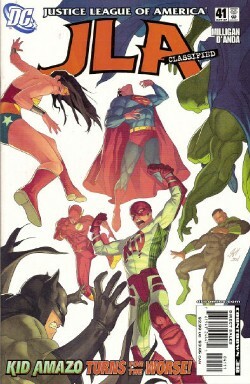 Next up is a Martian Manhunter arc. Should be interesting. It has a lot to live up to, really. Overall this arc was one of the best this series has produced thus far. I may actually buy the trade. And if DC is smart enough they'll print one. Art - 4: Action! As you like it. Or as I like it. Or as someone likes it. Anyway, like in the previous chapters of this arc I enjoyed D'Anda's work. It's an interesting take on the League and while Kid Amazo's costume didn't do all that much for me I can't bring myself to dislike the art because of it. Cover Art - 5: I am mighty! Look how I throw these Leaguers around! Fear me! Or at least that's what I got from this Sami Basri cover. The stark white background highlighted the colorful costumes and it matched the interior action pretty close. Looking at this cover I knew there was going to be some action and I wasn't disappointed. Good cover. Well deserving of a five.